The Irish record Sixgill stands at 69.8 kg (154 lb) caught by Andrew Ball of Essex in 1968. In the late part of 1993 off Baltimore Southern Ireland a much larger specimen was hooked by Stefano and handed after 45 minutes to Keith Walker who brought it to the surface. This super fish weighed 142.8 kg (315 lb) as two persons touched the rod the old record still stands. (Angling Times September 1993). 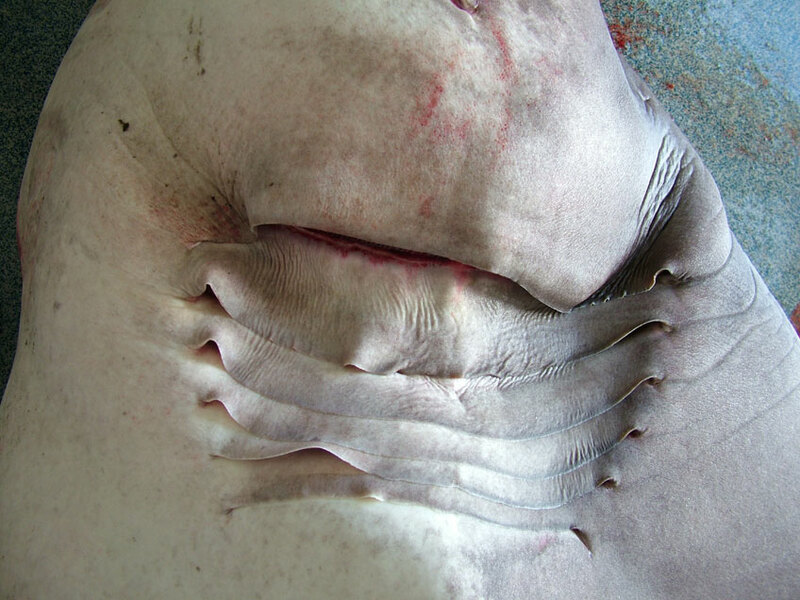 Hexanchus griseus have six gill slits (the majority of sharks have only five gill slits) and with only one dorsal fin set near the tail it is most distinctive. Mature specimens from 3.5 m to nearly 5 m total length (TL) spend all their lives in very deep waters from 500 m to 2000 m, with possible excursions to shallows waters at night to feed but very little is known about their behaviour. Mainly the juveniles and immature specimens are seen when caught from close inshore and in deeper waters from depth of 30 m to 500 m. These small specimen are rarely larger than 2.5 m ( 8') TL, @ 91 kg ( 200.5 lb). When I say small, they are compared to a very large stout bodied, round bluntly pointed headed, mature female of 4.82 m (15.4 feet) TL, and more than 650 kg (1432.6 lb). Smaller in size and weight among the predatory sharks only to the 7 m Great White shark, and the deep water Sleeper shark (Somniosus microcephalus) that grows to 6.4 m, and was also filmed at 2200 m deep. Colours range from dark brown to dark silvery grey with large, opalescent eyes. Biology; Females H. griseus mature at about 4.20 m to 4.50 m TL. They are ovoviviparous, which means that the eggs hatch inside the mother body, so the young are born alive and fully formed. H.griseus has a remarkable high fecundity (litter size), producing 22 to 108 live pups in every litter at about 0.65 m TL, @ 1.2 kg. A captured female of 4.21 m TL from off Church Rock, California, contained 51 near term embryos. Large, fast moving prey species, numerous shark and ray species (especially spurdog), any bony fish ( large deep water hake are a major prey item), squid, crabs, shrimps, swordfish, cetaceans and other marine mammals. This very large but little known shark is a rare visitor to our coastal waters. A few specimens of up to 54.3 kg, have been caught recently by boat anglers around Dingle Bay and Kinsale Bay, County Kerry off South West Ireland. Found when feeding on the large stocks of deep water fish in commercial fishing grounds around the UK. Marine Biologists survey the deep waters for fish and sharks, along the edge of the continental shelf. 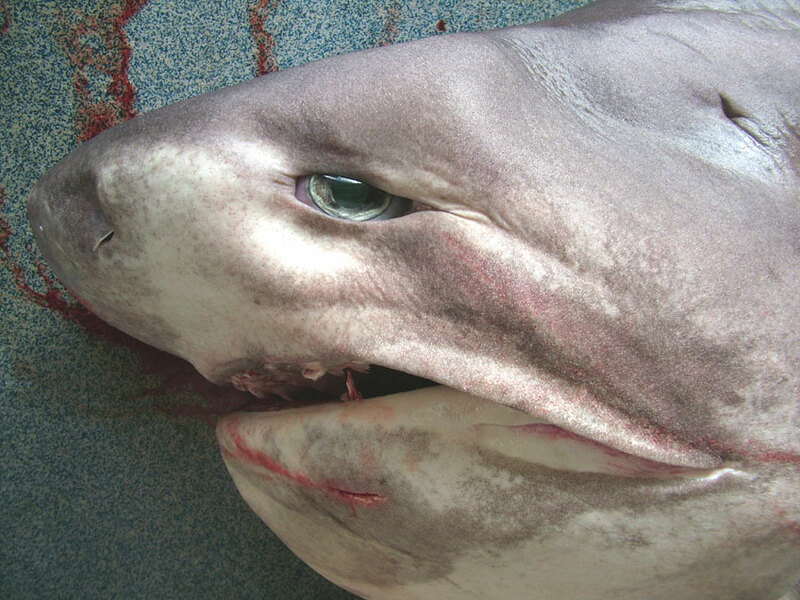 A rod caught Blunt-nosed Six-gilled Shark, Hexanchus griseus, was landed on board the Clare Dragoon out of Carrigaholt, County Clare, south-west Ireland. The fish which weighed in at 480 kg, (1056 lb), beats the existing European angling record which stands at 466 kg and was landed in the Azores. 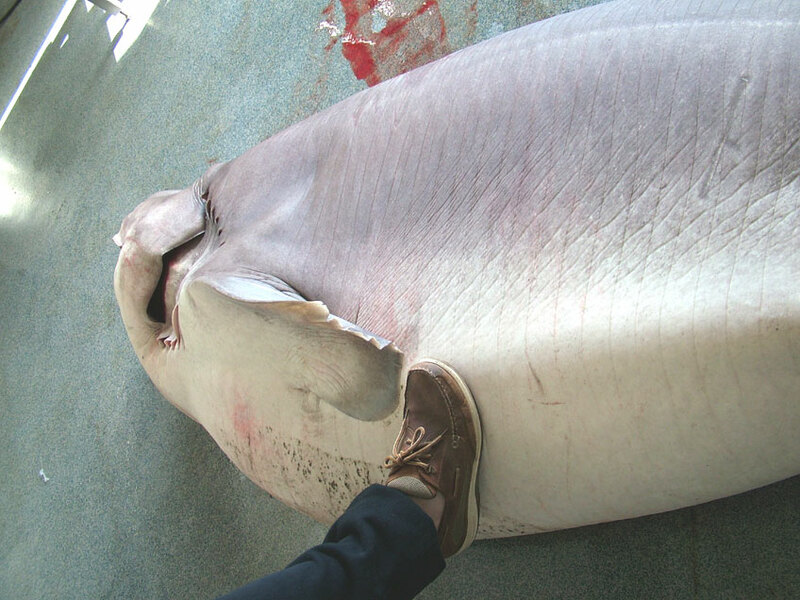 The shark was caught about three miles off Loop Head in County Clare Ireland. I believe the official length was 12 ft 6 " and weight 1056 lb. It was caught by a 70 year old man who had it on for 35 minutes . It could not be brought on board as it was so big so they tied a rope around its tail and towed it into Carrigaholt pier. I have added some more photos. The guy with his foot in the picture is a size 12 to give some idea of its size. I think its gerth was 8 ft. Sport angler Anton Kristiansen was out fishing with Turid Kvammen at Smøla, off the coast of Nordmøre, northwest Norway when he hooked and landed a Six-gilled Shark, Hexanchus griseus, called kamtannhaiin Norwegian. It measured 2.5 meters long and weighed 120 kg (264 lb). This shark is a deep water predatory species that is rarely caught by commerical fishermen and even less often by anglers.. I saw A six gill around July 25 1999. It was in the Gulf of Mexico (EB 160A), at 935 ft. I was on bottom in a Hardsuit. It was about 14-15 ft long. The suit video was on, and I do have a copy of it. The shark came out of the darkness, and passed within a couple feet of me. The video shows this very clearly, making identification easy. It was very exiciting. work between 200 and 300 fathoms. This past March through May 2000 I have caught and released approximately 12 sharks ranging in size from 8ft to 16ft off the east coast of Florida,between Ft.Pierce and Ft.Lauderdale. Also on the south side of Florida, between Key West and Dry Tartugus. But the largest of the 12 was caught around Desoto Canyon in the Gulf of Mexico south of Mobile, Alabama and Pensacola,Florida. If I find them any where else I'll let you know. Information wanted: Please send any records of this fish, with location, date, who discovered it, how it was identified, prevalence, common name and any other details to Shorewatch Project EMail Glaucus@hotmail.com.